Ballpark Basics: According to their website, they are the only class A affiliate to draw in over 400,000 fans. We paid the $6.00 price for reserved seat tickets, but having arrived on a Thirsty Thursday – 1.00 drafts, 2.00 talls, of ANYTHING on tap(!! 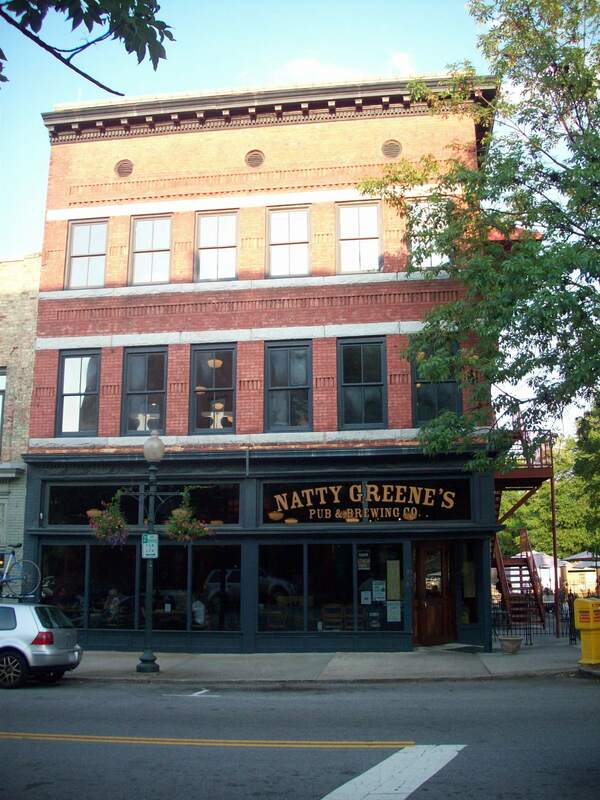 see our Natty Greene’s Greensboro post for more info)- we decided to grab one of the picnic tables overlooking third baseline so as to be closer to beer carts and pregame people watching. We were quickly, and suddenly grateful that we had such awesome, covered seating, as the skies opened up and quickly convinced us that the picnic table was in a much better location than any reserved seat we had paid for. We met some locals, who were happy to share our table out of the rain, and enjoyed all 4.5 innings before the torrential downpour had sufficiently flooded the field and drowned the players to call the game. Happily, they hadn’t played enough to call it a complete game so everyone in attendance was invited back, free of charge, to any other regular season game. Beer Basics: knowledgeable friendly staff, great beer at a good price, but not much of a happy hour. An easy one to pair considering the beer is available at the local ballparks AND is even sold on Thirsty Thursday (smart marketing!) for 1.00 draft beers and 2.00 tall beers. A definite steal! 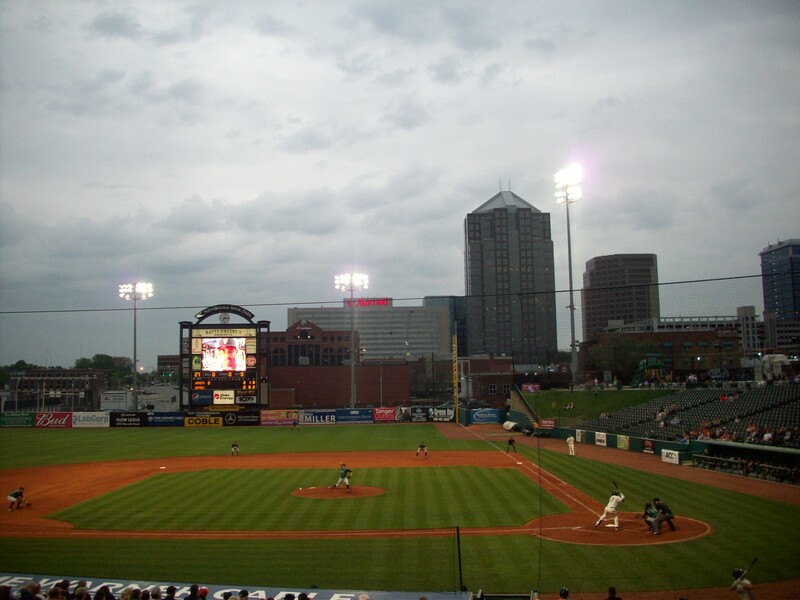 While we did actually try their beers at the Greensboro Grasshoppers stadium first, we enjoyed them so much, we made a specific trip to visit their brewery in person. 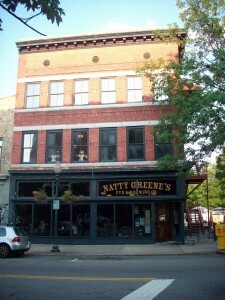 A large building on the corner of South Elm Street, Natty Greene’s was apparently one of the first buildings to move into the area, and is therefore credited with helping to spark the revitalization of the downtown. It has tables on the outdoor patio, a restaurant style seating area when you first walk in, a long bar near the vats, and a large upstairs with second bar and game room (arcade, shuffleboard, darts, etc) with multiple HDTVs, finally a large private party room completes this complex. Named after Nathaniel Greene, a general who made a name for himself during The American Revolution, It is beautifully decorated with murals giving you a glimpse of what historic Greensboro may have looked liked. Dark wood and a very interesting chandelier add to the atmosphere. There is no real happy hour, but each day they offer a “brewer’s choice” for 3.00/pint. We were only able to stop by for afternoon brews, but judging by the amount of people who were hanging out on a Tuesday afternoon; we would have loved to see it on a Friday or Saturday night as it is obvious this is neighborhood evening hot spot. This restaurant may have been where the original inspiration for this website hit…and after some research and a little coaching from the Natty Greene wait staff on exactly what IBUs are (basically, it measures the bitterness of a beer. The higher the number, the bitterer the beer) we were off and running! Revolution American IPA – A very popular seasonal. They were out of this one on our first visit, so Jim was kind enough to make a return trip in the name of journalistic thoroughness. 6.7% ABV with an IBU rating of 78 (read very bitter). A strong beer, with many layers, and a definite aroma. Kinda like a soldier during the Revolutionary War. Buckshot Amber Ale – 4.8 ABV. Gillian’s favorite. A colored beer with a toasty aroma and a hint of toffee. A well balanced ale that has the hint of sweet expected in an amber, but without being overpoweringly so. It is a smooth but rich beer with very little aftertaste. Old Town Brown Ale – 4.7% ABV. The bartender knew a lot about this one. It’s an English style beer which in this case means toasted malts and chocolate. Great dark color that’s thick and delicious. Slam Dunkelweizen – 5.1% ABV. While dunkels usually don’t rate very high on our list of favorite beers, they promoted this one as having a pineapple accent which was just intriguing enough to make us want a taste. Definite clove smell and wheaty thick body. The pineapple is there in the aroma and the aftertaste, but it’s one of those ingredients that you might not identify until you’re specifically looking for it. Not one you can order back to back to back, but absolutely worth ordering.